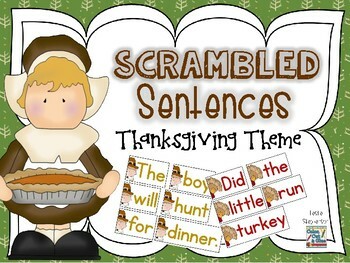 This product contains 9 scrambled sentences with a Thanksgiving theme and 4 recording sheet options. It is appropriate for first grade. It works well in a literacy center, as a pocket chart activity, or during your small group / RTI time as well. 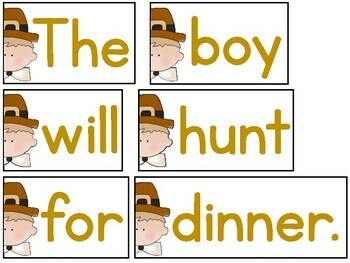 The boy will hunt for dinner. Did the little turkey run away? We can pick the big orange pumpkin. 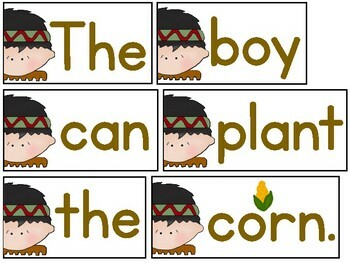 The boy can plant the yellow corn. I love to eat turkey and pumpkin pie. We eat dinner at my Gram's house. There were two dogs on the Mayflower. The Pilgrims had cheese and fish to eat. The first Thanksgiving was three days long. 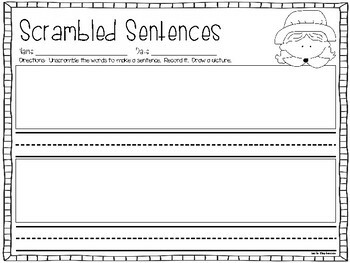 My own kiddos enjoyed unscrambling these sentences and I believe yours will, too!